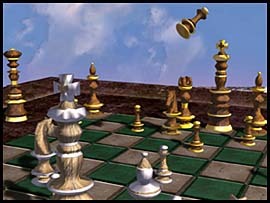 Experience Chess as you never have before. Three breath-taking worlds await you in nvChess, powered by the latest in hardware-accelerated pixel and vertex shader technology. Note: This demo was designed for use with nVidia graphic chipsets, and may not run in low-end systems. Works great on my ATI Radeon 8500!